Very dominant Afghani characteristics passed from the father. Sweet Chunk combines many of the positive attributes of both its parents. An original Sweet Pink Grapefruit cutting was used in the mother role, whist Deep Chunk was selected as father. Deep Chunk, a relatively unknown strain in Europe, is a pure Afghani IBL, renowned for its incredible resin production and vigour. Sweet Chunk grows very like its father. Its entire plant structure resembles an Afghani strain; characterised by broad, fleshy leaves, a very healthy root system and strong side branching during its vegetative stage. In flowering, also, this strain takes traits straight from its father. It produces compact and solid buds coated in huge amounts of resin. This strain is very popular with Afghani and traditional indica lovers. Although at first The Sweet Deep Grapefruit might be difficult to find in this cross, Sweet Chunk owes much of its sweet, fruity aroma and taste, and it’s stretching at the start of the flowering cycle, to its mother. Due to the very strong influence of Deep Chunk on the characteristics of this strain the plants grow very homogenous and stable. You will not find differing phenotypes in this strain. The yield can be described as moderate to good. Similar to many Afghani strains it is also a good strain for medicinal patients. Like many Afghani strains (with high amounts of CBD) this is likely to be popular with medical patients. Com o foco na qualidade acima da quantidade, Alpine Seeds se orgulha da estabilidade das genéticas das variedades únicas que oferecem. Um novo grupo de cultivo da Suíça, Alpine Seeds consiste de muitos reprodutores hábeis com uma riqueza de experiência e sucesso vindo de seu projeto anterior, Herbaria Seeds. 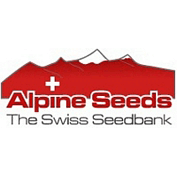 Você pode comprar Alpine Seeds de Seedsman e aproveitar a qualidade do produto de sua pequena, porém única, coleção. Estas variedades não foram extremamente cultivadas como muitas encontradas em outros lugares, o que significa que as plantas se desenvolvem com força e características bem determinadas.